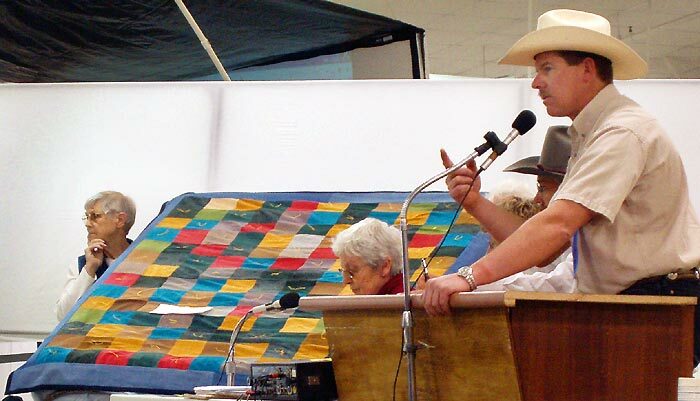 This past weekend saw the 2006 Mennonite Relief Sale (MCC sale) at the state fairgrounds in Hutchinson, KS. 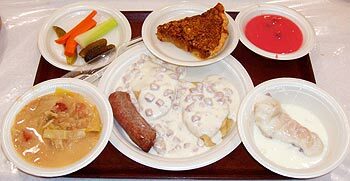 It's an annual event and I try not to miss it for the food and the heavy duty slice of rural Kansas Mennonite and Amish charm. 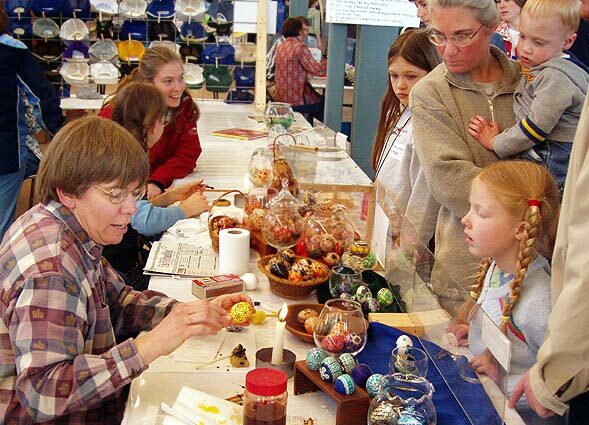 We ran across Janet Regier of Newton, KS, who has been practicing "pysanky", the art of decorating eggs, for over 12 years. 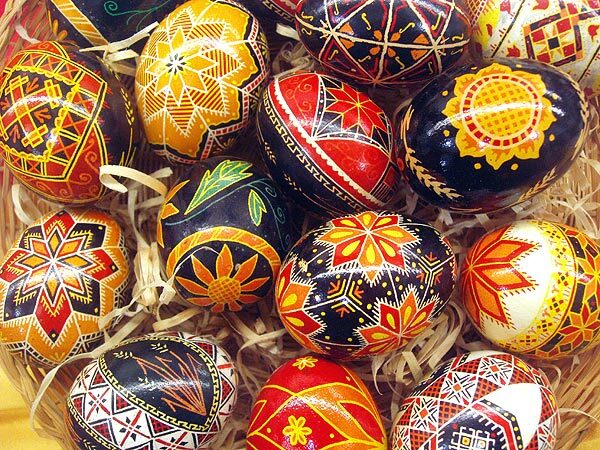 In the Ukraine, pysanky are often made during holy week and given as gifts to family members and friends. It is then traditional for the recipient to take them to church on Easter Sunday and have them blessed by a priest. 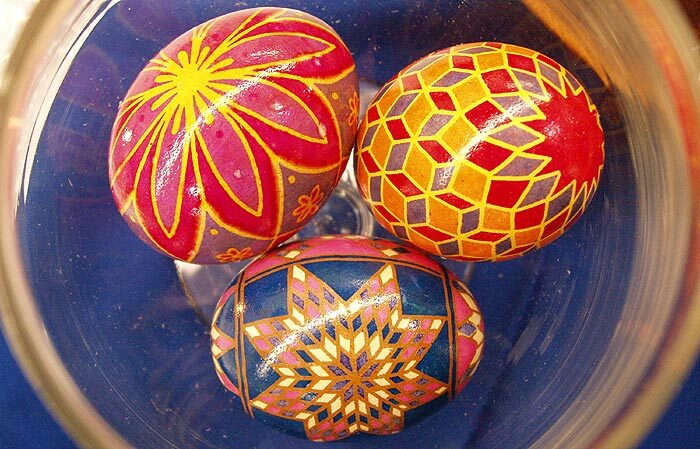 Individual eggs are called "pysanka". 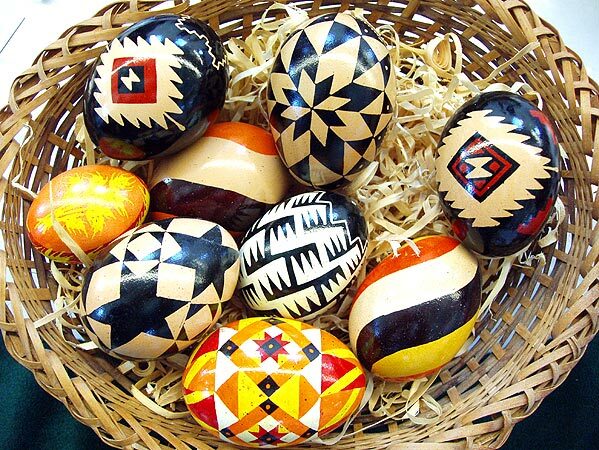 When pysanka are given as gifts, they are often presented in small baskets with plastic "grass". 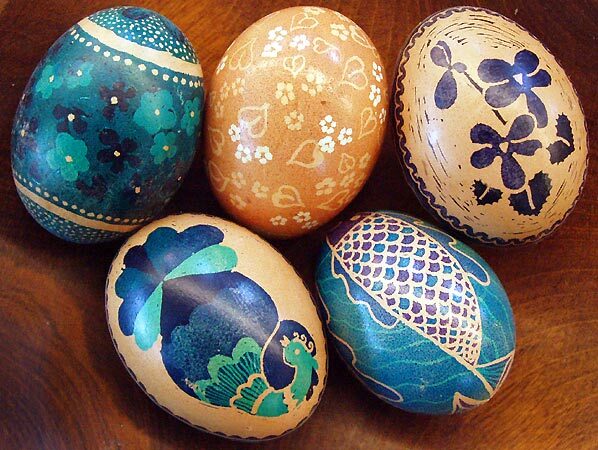 Although pysanky is a Christian and Ukrainian tradition, its roots are Pagan and stretch back well over 2000 years. Both Pagan and Christian symbols exist side-by-side in many examples, and modern artists also incorporate contemporary motifs, like the southwestern examples here. 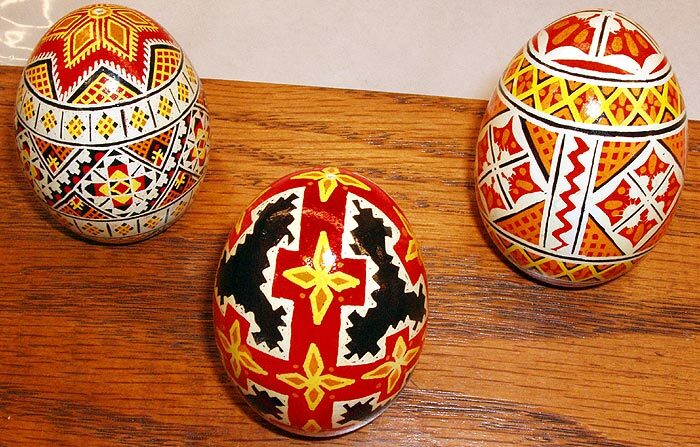 According to Ukrainian tradition, a pysanka which has been given as a gift is often placed in an oversized brandy snifter and displayed in the home. Regier says she made about 2/3 of the eggs displayed at her table with the balance having been created by Kathleen Neff, also of Newton. 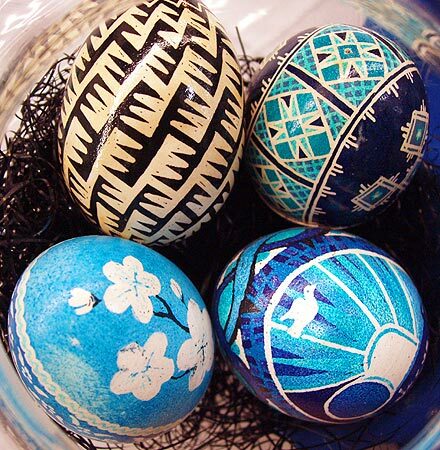 She says she spent two days making the egg on the left, the longest amount of time yet. Regier heats a traditional hollow metal stylus called a "Kistka". 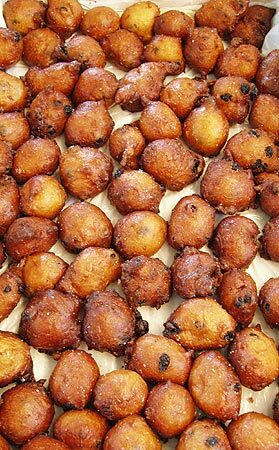 The kistka is then used to melt and pick up a small amount of beeswax. 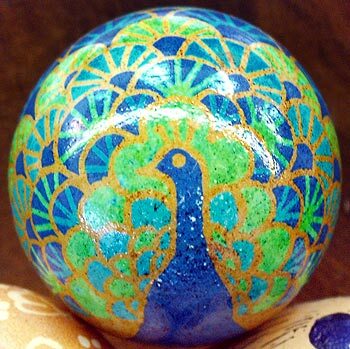 The term "pysanky" is Ukrainian for "things that are written upon", and that is just what happens. 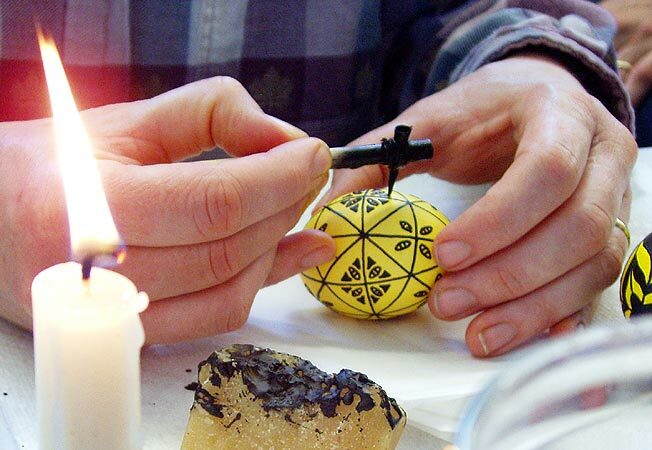 Melted beeswax is drawn onto the egg with the kistka. 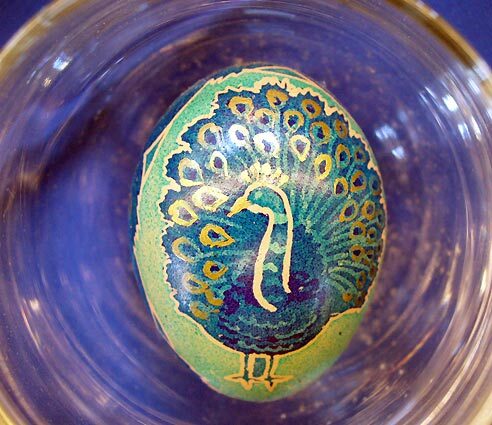 Often, the egg has been dyed a light color before this part of the process. The eggs are then dyed; the wax prevents dye from reaching covered parts of the egg and is then removed to reveal the underlying color. Often the process is repeated to create more then one color. Dyes proceed from lighter to darker for practical as well as symbolic reasons. The progression from light to dark symbolizes, among other things, the stages of life. 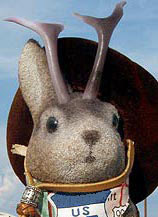 ...not to mention an attentive one. 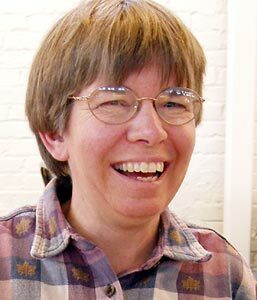 I found a site for basic pysanky instruction on the net. 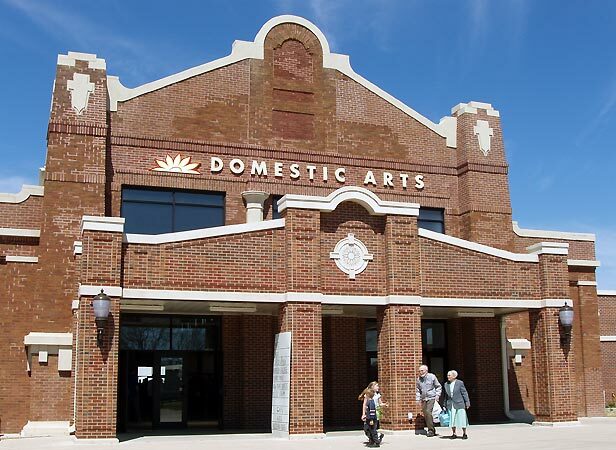 Regier was set up with other vendors in the Domestic Arts Building. 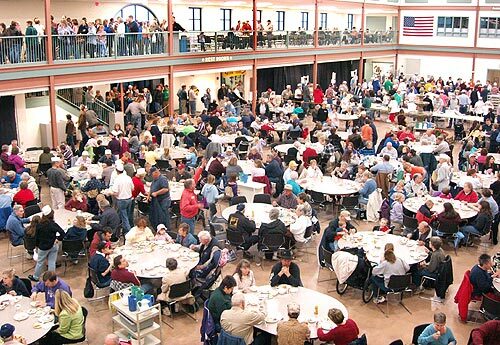 The MCC sale is noted for a huge German Buffet. Literally hundreds of people wait in line for it. There's a reason the food picture is small. I find that German food is well...satisfyingly filling and good in context of an event, but it's not photogenic. 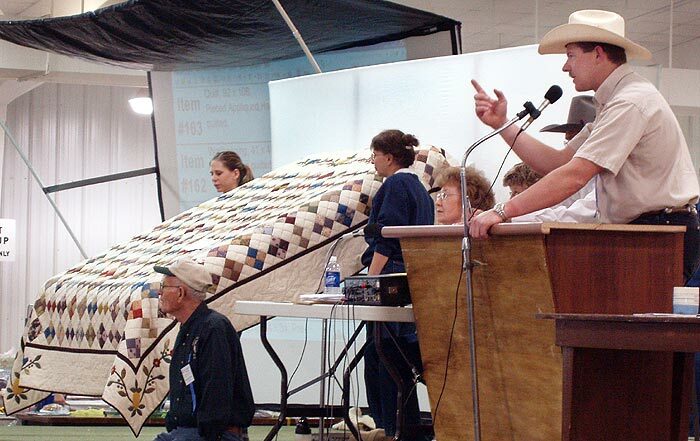 The big event of the MCC sale is the quilt auction. 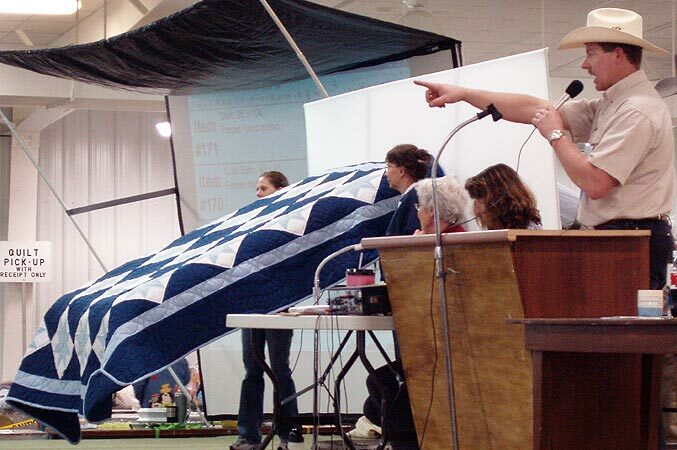 According to the MCC website, "over 70 Mennonite, Brethren in Christ, and Amish congregations in Kansas, and their friends, donate their gifts and services for this annual festival and benefit auction." 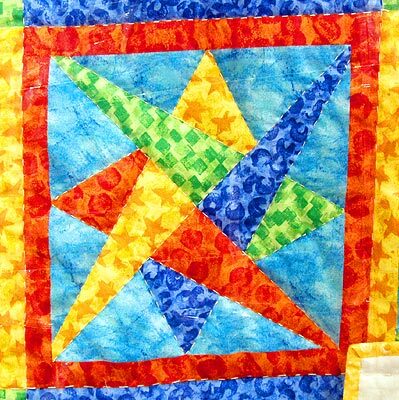 That includes the quilts. Some of these things go for thousands of dollars. 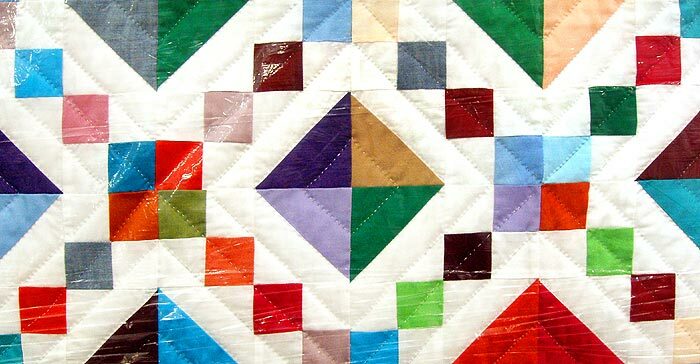 I under-appreciate quilts; I love my electric blanket. But, they can make nice graphics. 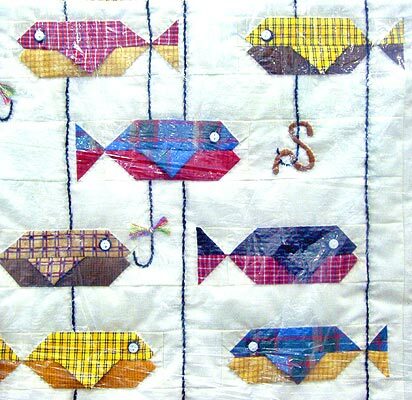 One fish, two fish, red fish, plaid fish? 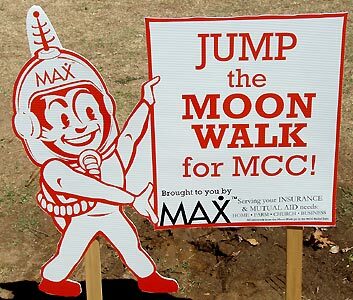 I wouldn't ordinarily throw in a cardboard advertising sign, but I never expected to find a retro space-age graphic here. 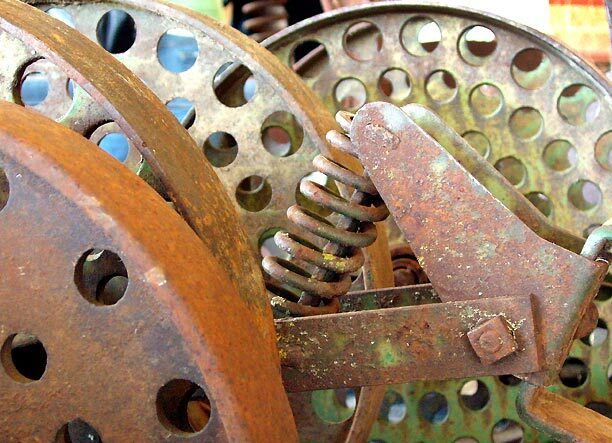 Among the items for sale by vendors were these wheat drill wheels. No, I didn't know what they were; I had to ask. I am somehow reminded of the 1925 silent film, Metropolis, which showed a future dominated by huge machines. 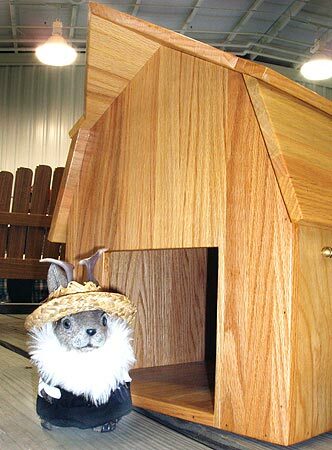 Ace read up on the event and disguised himself as a local farmer to check out this finely crafted miniature barn at the general auction.